Here are my scores when I applied. TU 680, EX 694. SL was $8500. Discover It is a great card. Their customer service and app is really second to none. I lost my card once and it was literally replaced the next day. Had a fraudulent charge and it was taken care of. Like their ads say, all their customer reps were US based. Their app is also really good. I have Citi and Chase cards as well and their apps cannot compare. You get your alerts on transactions immediately. Paying bills through your app is also very simple. The only thing that bugs me a lot is the 5% rewards where you have to sign up every 3 months. It is really irritating that you have to sign up every time. They should just make that automatic. I was really surprised that I was approved for Discover with my score. I do have the Cap One QS and only got a $500 CL. So I was surprised that Discover gave me a $3000 SL. The most impressive thing about this card (or rather Discover) is the app. It is really real-time. Everything gets updated real time. You can pay your bills any time and there is hardly any payment holds. You could also check your FICO score through the app. I am not really impressed with the 5% cash back because I do not use the 5% all the time. But that is just me. On hindsight, I should have just gotten the Chrome instead. Got this card because of the 5% cash back and the low interest rate (I got 12.99%). My score was 745 EX and I was approved for $10k. After a year, my credit limit was increased by $5k to $15k. Thank you Discover. My credit score is considered ok (722 with TU) and I was given a SL of $8500. I was contemplating of getting the Chrome but chose to get the IT instead because of the 5% rewards. I do use the gas and shopping and amazon stuff in Q4. But the stuff in Q2 for spring does not really apply to me. The app is simply great. Like many others here have commented, it is literally real time. I also like that I can monitor my FICO score. It updates about once a month and it is really useful to be on top of it. I only had to use customer service once when I lost my card. They replaced it the next evening. So far so good. I have this bad experience with the card which has kind of soured my relationship with Discover. I made some purchase online with a retailer. I used my Amex card initially but I was close to my limit so I used Discover for another bulk of purchases. On this particular order (in fact 2 orders), the merchant failed to deliver. I made phone calls to both Discover and Amex and told them about the situation. I even printed the email confirmation of orders and sent it to them. Well, guess what? I got two difference outcomes from Discover and Amex sided with me and the bill from that merchant was removed from the bill. Discover ruled in favor of the merchant. I am not going to use Discover going forward. I absolutely love this card. I do not have the best credit, but Discover still approved me. You really can earn a LOT of cash back. The 5% categories are great. You do have to activate every three months (remember that and if you don't you will get email reminders anyway). But aside from that, Discover has deals with online partners (log into Discover, click on the online merchants site, use your Discover to pay). If you make use of all of these, it all adds up. Here's a tip. max out your cash back during the first year. What do I mean? Like make sure you meet the spending and earn whatever sign up bonus they give. Refer a friend and get cash back bonus. 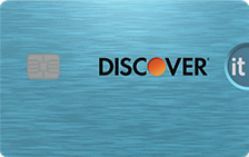 the reason is that Discover will double ALL cash back you have earned during your first year. Like others have said here. Their app is really good. I have had this card for over a year. When I applied, my CK score was about 686. But after I got approved for the card, I found out that they pulled EQ and I had a 740 score (what a difference with creditkarma). I was approved for $12800 (which is a very odd number) and given 0% for 14 months (both BT and purchase). I actually used the card to buy a imac 5k. So I managed to get the 5% cash back as apple.com is one of their shopping partners and and I also took advantage of the 14 month 0% apr. I paid off the iMac after 14 months and have been using the card regularly. I find the 5% cash back very useful though you have to be on top of it. Their app is also good and I like that I can check my FICO score for free. For 8 months, I had a great experience with this card. Virtually every store I go to accepts discover. Then one day I found a fraudulent charge on my account. And Discover reps that I spoke to ( a few of them) did not seem to bother or really go out of their way to help. I have an Amex card and I can say with experience that whenever I have any fraudulent charges on Amex, their philosophy is that the "customer is always right" and a dispute is filed immediately, the bill from that merchant is suspended and almost all the time, the problem is resolved and you do not hear from Amex anymore. I will stop using the Discover and stick to my Amex. My TU score was 783 and EX was 798. I got approved instantly and got a $7,500 SL. I also got 0% apr for 14 months. I am happy with the card so far though I am quite surprised that I only got $7500 after reading here that folks got higher credit limits with lower scores! Have had this card for 8 months and I love it. The 5% category is good sometimes and not so good other times. 5% on gas is my favorite but also during Q4 when you can earn 5% at amazon. I have also earned 5% cash back from their merchant partners. Their app is the best among all issuers (at least the ones that I have). They post very quickly. For example, at restaurants, I will get notification before I leave the restaurant. When I am at wholefoods for example, I will also get alert the moment the swiper ask me to remove the card! I also love that I can check my fico score. I have cash back cards from Amex (BCE) and Citi DoubleCash and decided to give Discover a shot because of the 5% category. I now use a combination of these 3 cards so I can maximize my cash back earnings. At supermarkets, I use the BCE. I use the 5% category cash back when I can with Discover and Citi DoubleCash is for the rest. Among the three cards, I would say that Discover definitely has the best app. I can check my FICO scores with all three and this is the right combo of cash back cards for myself. I got the Discover It while my hubby got the chrome. We are also authorized users on each other's card. We basically use one or the other whichever gives us a higher cash back. My suggestion would be to get both (since they both have no annual fee) and you can earn more cash back by combining the two cards. I was really surprised to get this card. I have been rebuilding my credit since my BK 3 years ago (due to medical bills). I have been using 2 secured cards and this was my first unsecured credit card. From what I have read, with my scores, I expected to be declined and offered their secured card. Instead, I was approved with a $2500 SL and my score was EX 590. I will be using this card as my main card from now on and hopefully I will get a credit line increase after a while. I have Amex, BOA and Chase and finally decided to get a Discover as I have been swayed by their ads about their customer service. I applied online and got the 7-10 day message. Was told to call them after a couple of days and after answering a few questions about my mortgage and income, I was approved for $6000. My card arrived about a week later and the first thing I did was to download the app. After my first statement arrived, I signed up for autopay (since you could only do that after the first statement arrives). The app is really cool and among all my other apps, it alerts you the fastest (as in almost immediately after a transaction clears). So I found the 5% category useful but not all the time. However, I like that I can also earn 5% cash back shopping with their partners. I have been using the card for about a year and a half. The card is good and the rewards are great. The only thing that peeved me off is that when I applied, I wanted to do a balance transfer. When I was approved, I was not told how long the introductory period was. On the web site it said 14 months at 0%. But when I got it, I was offered only 6 months at 0%. Customer rep told me it was due to my credit. Aside from this disappointment, the card is great. But still, I will give this a 3-star because of this. My credit was not exactly the best when I got this card. TU score was about 660 but I got approved with $3500 SL. I really love this card a lot. The 5% rewards absolutely work for me (it may not for you but it does for me). I was also really thrilled when I got double my cash back after the first year. I used some of the cash back and exchanged them for gift cards. After 8 months, Discovered increased my limit by $1000. After 14 months, they increased it by another $1000. Now, my total limit is $5500. All I have been doing is paying in full every month. I charge about $800 give and take each month on the card. Like many others have said here, their app is absolutely top notch. Two years ago, my credit score was in the 500s. I got two secured credit cards to rebuild my credit. I got the Opensky and Capital One. I started off with $200 credit limit each. Cap One gave me an increase after a while and after a year and a half, I was approved for the Cap One Quicksilver. Not long after, I was approved for the Capital One Platinum card. I got $800 and $750 limits for both these cards respectively. But my credit score started to improved and after I got both the unsecured Cap One cards, my scores were about mid 600s. It was then that I decided to give Discover a shot. I went to their pre-approval page and filled in the details. They came back recommending the 5% category card. For some reason I just went ahead and lo and behold, instant approval for $8000 SL!!! I couldn't be happier with the card. The customer service response is faster and friendlier than Cap One. App is also great. If you have scores around my area, I would say go for it. I filled out the pre-approval page on Discover's website and the suggestion was that I get the IT card. After a few questions, I was approved almost instantly (or 60 seconds as they suggested)! And my starting credit limit was $10000. This is now my card with the highest credit limit. I got instantly approved for the card with a $12k limit. But I was not given my 0% deal so I did not know for how long it was even thought it was a 14 month intro deal on the website. In the end, I got 9 months intro period and not 14 months as per the website! Stay clear of Discover. They are not being honest. 9 months ago, my score was about 595. I had a couple of late payments and my score just tanked. I worked very hard to fix my credit. I took on a couple of side jobs, drove uber at night and started to be on time on my bills again. I also disputed a couple of errors on my reports and had them removed. Fast forward to today, and I decided to get a Discover card after reading all the great reviews. I applied over the phone and after what seemed like eternity, I was finally approved and couldn't believe it when they told me that my starting credit limit was $10,000! I came here to the US on a H1B. I had no credit but ahead to apply for the Discover it after I got my SSN. I got approved for $1500. I did research online about building credit history in the US. So I just charged $300 a month (20% utilization ratio) on the card and pay off in full every month. I set up autopay with my Bank of America account so everything is automatic. In 6 months, my score has increased to 730. To be honest, I did not know what my score was when I applied since I had no history. So I just put 500 here (but I do not think it is accurate). Two years into my rebuilding, all I had was a couple of secured cards. When I decided to try my luck on an unsecured card, I did some research and decided to go with Discover it. I was approved for %1500. My score back then was about 650. Every six months or so, I would call them up for a credit line increase. For the first two, it was like $300 each time. It was only a soft pull so I continued to ask for increases. After 3 1/2 years, my limit is now $6000. In fact, it is now my main card. The card is very similar to Chase Freedom with the 5% categories. But their customer services is absolutely top notch. I lost my card once and it was replaced literally the next day. Their app is also top notch. A few months after I was discharged from BK 7, I received mails from Discover. I finally decided to give it a shot and applied. That was about 8 months after my BK. I was approved with a $1500 credit limit. After 14 months, my limit was increased to $3000. I really love this card and I have never found a place that does not accept discover. I like the rewards and have used the 5% rewards quite a lot. However, not every one suits me and there have been times when I have not used that for say 2 months. The only irritating thing is that you have to "sign up" every quarter for the next 5% rewards. I also choose to redeem my rewards with pure cash back (check). I have also bought a couple of items from macys.com and nike.com for their shopdiscover portal and earned 5% cash back. Another tip is to use their app. It is super user friendly and you can check your transactions, pay bills with it and even checked your fico score. I set up my bills for auto-pay after I got my first billing statement. When I applied, my FICO score was about 620. It is now about 690 or so. However, just after my BK, my scores were in the high 400s. I managed to bump it up because I got the Cap One secured. That was the first card I got before this. Since then, I have opened a couple more cards. I now have Cap One QS - $4000 CL. BCE - SL - $3000, CL - $10000. I will keep and continue to use this card though because I really like everything about it, from rewards to customer service and their app too. I decided to apply for the Discover it because I just wanted to diversify my credit cards. I have the Amex BCE and the Chase Freedom. Since the Chase Freedom also has 5% categories, I was familiar with it. My score was in the high 700s and I got a starting credit line of $15,000. The 5% rotating categories works the same way as the Chase Freedom. You get an email every quarter and you have to "activate" it to earn the 5% rewards (when you spend on those categories). To be honest, I find that to be really irritating. The one area where I think Discover is better is the online shopping portal. With Discover, you earn 5% with every partner whereas with Chase, it varies. I also think the customer service is more responsive (lower wait times). The double you cash back after the first year was also very nice. I decided to try out this card because of the 5% category bonus. I find it ok though I hate having to activate every 3 months. One thing I did notice is that the cash back I earn takes a month to post. Capital One posts almost immediately. The thing that impresses me most about Discover is that the customer service is great as advertised - all US based. I lost my card once, called them and it was delivered the next day. The app is also great and you get alerts for every transaction that you make. I got this card because of their 0% for 14 month deal. I got approved but when my card arrived, I found out that the interest rate after the promo period ended was going to be like 21.49%. I called customer service to see if they could lower it to 12.49% (which is the lowest APR). Customer rep said with a straight face that they could not, but offered me 19.49% instead. I told them that they are giving me every incentive to transfer my balance to another card once the promo period ended. She just simply said she understood where I was coming from and will bring my concerns to management! Many folks here get this card for the rewards. But if you need a card with low rate, this is not the card you get. Got approved for Discover a year ago for a $4k credit limit. I got it for 14 months balance transfer which I used and also got the 2X cash back bonus after one year. I do use the 5% categories and scored a big one with home improvement expenses during Q2 this year. I also have the BCE for gas and groceries and the Capital One QS for "other purchases" 1.5% cash back. The app is great and I get notified for all my transactions. They do show your FICO score. You can pay your bills through the app but I have already set up autopay. I was absolutely over the moon when I got approved for the card. I was discharged rom BK one and a half years prior and never really expected to be approved. But I was and got the card a week later. My score was 622 (real FICO) and was given a $2,500 limit. The card came in a very nice package. I have been very careful about this card and I make sure I pay in full and on time. The app makes it so easy. My credit limit is low and I do not earn that much cash back. But it is good to know that I can earn 5% on some items. I got instantly approved 2 weeks ago. My scores aren't that great as the average was about 678. I got a $3,000 limit. My only other card is the Cap One QS with a $500 limit. I love my Discover card but for one thing. Why do they make you activate the 5% categories every three months. I get an email once a quarter asking me to "activate" through a click on the email. I find this really irritating. Can't Discover just "auto-enroll" every quarter. It just seems like an unnecessary step. I suppose that the email reminds us of the "new categories" - but they could just simple email us the new categories without requiring that we "activate it". I am so glad I got this card. I applied with a 756 score and got an $8000 credit line. I got the $50 bonus and also like it that I can use my rewards at amazon.com. The 5% rewards on the categories are also great. I especially look forward to the 5% on gas! I can also choose to get the rewards via check or exchange for gift cards. I also got my "double cash back" after one year. I have now gotten into the habit of checking my fico score every time I check the website or the app (which is great). I have always got a Visa and my Amex Green in my wallet. Finally decided to give Discover a shot. And I had have absolutely no regrets. The key thing is their app. I use their app all the time. You can make your payments and pay early if you want. You can check your fico score as well. The rewards are good and I have used them for gift cards as well as getting my checks. Customer service is good but I mostly use the live chat (much easier and no wait time). It was a toss up between this card and the chrome. I opted for this card because I though that the 5% categories sutied me a little more. I got this card when my credit score was like 750ish and I got a $10,000 credit limit. The app is great and if you set it up correctly, you get an alert for every transaction. I set up autopay as soon as I could (you could only do it after the first statement). I also found out that you could shop (via their website) at online retailers and earn 5% cash back. I recently bought a pair of boots at Macy's and did earn 5% cash back (showed up a couple of weeks later). I am a rebuilder and I received mails from Discover. So I decided to check their "pre-approval" site and after I submitted my info, it said : "We found a personalized offer for you" and the same 15.49%, and a 0% APR offer for the first 14 months on purchases." Took the offer and got $2500 limit. Sweet. What a wonderful this card is. I absolutely love the cash back bonus and I try to make use of the 5% as much as I can. I have to say that after living with a Bank of America card for the last 4 years, the customer service for Discover is simply at another level. Another really useful feature they have is that you can earn 5% cash back when you shop online with their online partners. I shop at macys.com a lot and when you do it through discover, you save a lot of money.